The fan-shaped summit of Yulong Snow Mountain dominates the cobblestoned old town of Lijiang, which is spread before the mountain like a votive offering on an altar table. The famous Ming-dynasty travel writer Xu Xiake supposedly gasped in admiration on seeing the mountain, which stands in the sub-Himalayan margins of China's Yunnan province, and whose name in Chinese means "jade dragon". In the 1940s, botanist-adventurer Joseph Rock wrote several influential articles about Yulong for National Geographic magazine and these later inspired a series of cantos by his American compatriot, the poet Ezra Pound. The best time to visit is from November to April, when snow has built up on the peaks and clear skies enable great views. In the course of researching our new book, Lijiang: In Search Of The Forgotten Kingdom-which testifies to its phoenix-like rise from near-destruction by an earthquake 20 years ago - photographer Pamela Pan and I reachLijiang Old Town in January, well ahead of the great tourist wave that breaks over north-west Yunnan in high season. Since being rebuilt following an earthquake in 1996, and attaining Unesco World Heritage status the following year, Lijiang has become a hipster favourite where the mesmeric drone of Naxi drums and songs echoes night and day. Yulong Snow Mountain is situated 15km north of Lijiang Old Town in the Chinese province of Yunnan. The Lijiang area is served by Lijiang Sanyi International Airport, 28km south of Lijiang city. Many passengers will change planes at Kunming, but there are also a limited number of direct flights from the biggest Chinese cities. The standard fare for the Kunming-Lijiang shuttle is about 700 yuan (S$146), but online fares of 400 to 500 yuan can be found at times. Shuttle buses run between the airport and Shangri-La Avenue, near the interface of the old and new city districts in downtown Lijiang. The one-hour shuttle service costs 20 yuan. Meanwhile, a taxi to or from the airport should cost about 80 to 100 yuan. • Because there is no public bus from Lijiang Old Town to the mountain, tourists must charter a taxi, car or mini-van from the Lijiang downtown area for 100 to 200 yuan a day, not including the purchase of tickets. The Big Yulong Package costs 230 yuan a person and covers entrance to the Yulong Tourist Area, which includes Yulong Snow Mountain. It also includes free rides in the green eco-buses as well as admission to several other sights in the wider Yulong Scenic Area. • After purchasing tickets for admission to the Yulong Tourist Area, visitors board a blue eco-bus which, for a fee of 20 yuan, transports them back and forth between the parking area and visitor centre. Subsequently, at the visitor centre, transfer to the free green battery-operated buses to reach attractions such as Glacier Park, Spruce Meadow, Blue Moon Valley and other tourist points. A separate bus service operates within Blue Moon Valley, at a cost of 50 yuan, although you need to take the green bus to reach there. • Many visitors choose to pack oxygen supplies. This is not unreasonable as the Glacier Park scenic spot served by the cable car is 4,500m to 4,700m above sea level, considerably higher than Lhasa in Tibet. Canisters of the life-sustaining gas can be bought in downtown supermarkets or at the cable car station. • Many new arrivals to Lijiang head straight for the cobblestoned lanes of Lijiang Old Town, where there is a large number of generally charming Naxi-themed courtyard guesthouses to choose from. It is not a bad idea to explore the lanes around Sifang Street and choose what suits you. In high season from May to October, though, it may be sensible to book in advance. One higher-end option is the luxurious Banyan Tree, Lijiang (www.banyantree.com/en/china/lijiang) located 4km away amid forests in the old tea-horse town of Shuhe, against the beautiful backdrop of Yulong Snow Mountain. The Naxi are the most familiar of Lijiang's many ethnic minority groups, due to their large cultural footprint in the Old Town. They are thought to have come south from north-western China towards Tibetan-populated regions and settled in the highly fertile Lijiang area by the third century. Even as we browse the humming hive of Naxi-themed boutiques showcasing local handicrafts, our eyes are drawn inexorably north to the jagged ice peaks of the massive snow mountain, the sacred home of the Naxi god Sanduo. Prior to our Yulong ascent as a day trip from Lijiang, we make repeated forays for extra layers at the city's covered market, returning with embarrassing frequency after we find we had underestimated our capacity for cold. But we had been warned to prepare for temperatures of as low as minus 12 deg C on the slopes of Yulong's highest peak, Shanzidou, or Fan Peak, which soars 5,596m above sea level. The preferred time for setting out on any significant journey in China is as early as possible. Because public bus and private car access to the Yulong Tourist Area is restricted, we charter a mini-van from the downtown area for around 100 yuan (S$20). As we shiver in the dawn, we see that to the right of Shanzidou, like a sitting Buddha's halo, is a peak called Snow Mountain Buddha. The other jagged snow peaks of the Yulong range have inspired names such asBlack and White Jade Butterfly, which equally appeal to the allegorical Chinese imagination. Opposite Yulong is its perpendicular but slightly shorter twin, Haba Snow Mountain, at 5,396m. According to our guide's enthusiastic recounting of a legend, Yulong and Haba were twin brothers who did battle with a murderous demon. During the battle, Haba was slain, but Yulong stood guard over the area with his 13 swords to prevent the demon from returning. The remains of Haba eventually ossified as Haba Snow Mountain while Yulong's 13 swords became the 13 peaks of Yulong Snow Mountain. We stop in a carpark for our guide to buy tickets (230 yuan) before boarding a blue eco-bus, which takesus to the Yulong Visitor Centre in an area called Gan Haizi (The Dry Lake). This was an alpine ice lake until the 1940s when the snow line rose and Gan Haizi dried up. As we disembark, we are greeted by panoramic views of the mountain's 13 snow-capped peaks and meadow pastures surrounded by large forests of Yunnan pine in the morning air. Beyond are stretches of typical highland pasture scenery where local herders' cattle, goats, sheep and domesticated yaks graze. Our bus needles through the pine forests for about 20 minutes towards the embarkation point for our first destination, Glacier Park on the slopes of Shanzidou. It has been conquered only once - on May 8, 1987 - by an American expedition team who rated the climb at maximum technical difficulty, with high risk of avalanches. Moments before boarding the cable car, our usually robust Naxi guide surprises us with the news that he will not be accompanying us to the peak. "It's the mountain sickness. It affects me badly. It's high up there, you know." This is hardly reassuring information from someone who was born in this "thin air". But we take our berths in the eight-seat carriage, trying to feel reassured by Italian advanced cable technology. The drops are steep, but after a while, when we dare to look, we are rewarded by beautiful views of alpine flora distributed over an ever-changing landscape. Our ride takes us from sub-tropical heat to icy cold in about 15 minutes, as we are reeled 2,968m to the main peak of the upper station. From valley to peak, in succession comes Yunnan pine, huashan pine, hemlock, spruce and sequoia fir, until above 4,000m, just a few shrubs cling to the rocks. Finally, the cable line pierces the heart of a vast ice and snow world. We emerge into the open Glacier Park, whose main feature is White Water One, typical of the 19 Shanzidou glaciers, which have an age of about 80,000 years. This piece of glacial real estate is an irregular prism, around 1,000m from east to west and 600m wide from north to south, which seems to be slowly crawling down the east slope of the mountain. A short climb to a higher peak at an altitude of 4,680m leaves us slightly short of breath but rewarded with a beautiful panoramic view of the glacier: an ice tower forest, like a knife stabbing the sky. In the glare of the sun, the ice tower forest is not monotonous white but glinted with green, as if a huge jade shard is frozen inside. This remote glacial world is also unquiet because, near the glaciers, we often hear the sound of cascading water from melting ice. Sometimes, from the front of the fan peak, we hear starker bursts of loud noise, the sound of a mini-avalanche. Standing in this chilly place, we understand why the Naxi people believe this is the home of Sanduo, their protector god. The festival held in Sanduo's honour, during Chinese New Year, is the solemnest date in the Naxi calendar. Even with our oxygen canisters, we are ready to descend after about 20 minutes and ride the eco-bus to a more low-lying attraction, Blue Moon Valley. On the north side of Yulong's frozen natural reservoir, melting snow and ice flows into the Baishui River and Heishui River, which in Blue Moon Valley conjure an incomparably beautiful natural landscape. The water appears ultramarine due to the presence of glacial ice and the name was inspired by the appearance of the moon in the blue lake. British writer James Hilton's concept of Shangri-La in his novel Lost Horizon (1933) is believed to have been inspired by reading about Lijiang. Once we enter the valley, we see that its waters are a natural mirror reflecting the grand snow mountain, surrounding cliffs and lush plants. Small shoals break the smooth surface of the waters. One of the best opportunities for photography is White Water Terrace, which is made up of fan-shaped stairs with the river running down from each step, looking like shining shells under the sunlight. Our guide is quick to tell us that, according to tradition, when two Naxi youngsters fall in love, the boy will be tested by standing barefoot in the piercing cold river in winter to show his commitment to the girl. Spruce Meadow, our next destination at Yulong, also has deep Naxi spiritual and romantic associations and this alpine meadow surrounded by spruce forests is perhaps the loveliest spot on the mountain. In winter, the snow-screen backdrop of Yulong Snow Mountain and the plateau blanketed with white snow offers a desolate kind of beauty. The Spruce Meadow is regarded by the Naxi as an entrance to the third country, a heaven where people can love and be together freely. From the Qing dynasty, the Naxi's traditional romantic-love matrimonial system was increasingly influenced by the more rigid system adopted from Han Chinese culture. Legend says that Spruce Meadow became a place for young lovers to sacrifice themselves in honour of true love, so as to escape from arranged marriages and feudal ethics. It became a relatively common occurrence for thwarted couples to make their way there and hang themselves in the woods or kill themselves by exposure to the elements. One such tale of doomed love is affectingly dramatised in Zhang Yimou's Impression: Lijiang show, part of a franchise of theatrical spectaculars devised by the film director and staged at tourist-friendly locations. This celebration of the cultures of the peopleof the Lijiang area - performed at Gan Haizi - make for a suitably rousing closing act of our Yulong visit. The show involves 500 singing, dancing and rodeoing representatives of Lijiang's 10 indigenous ethnic minorities. And during scenes inspired by the Tea Horse Road, an ancient network of caravan paths, 100 horses thunder around the arena. The real show-stopper, though, is the drama's setting in a natural amphitheatre at an altitude of 3,050m against the unsurpassable backdrop of Yulong Snow Mountain. 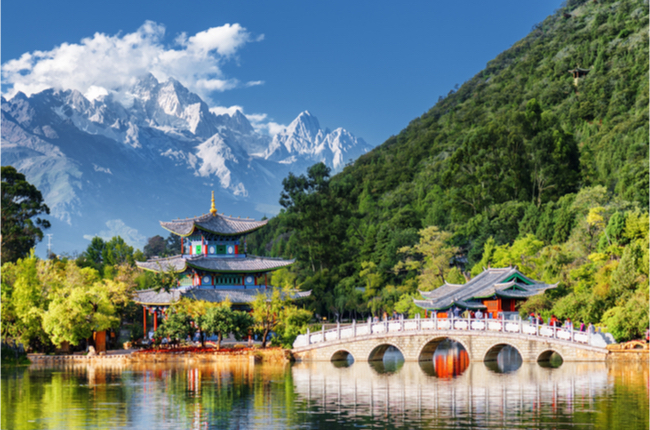 The emotional performances demonstrate that, for the people of the ancient kingdom of Lijiang, this mighty mountain range with its glaciers, blue waters and flowering meadows still endures as a sacred centrepiece.